Love: All new 2018 products!!! 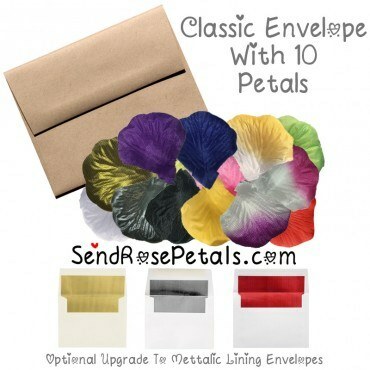 Sending rose petals in an envelope to your loved one is not only one of the most unique valentine's day gifts out there, but it is definitely something they have never received before. Bringing something this different and this magical, whether it's Valentine's day or not, is purely something they will remember and cherish. Bring a smile to their face as they open the envelope finding it filled with rose petals and a note written by yourself. Send to moms, wife's, girlfriends, friends, whoever! It will be a gift they truly remember and love. 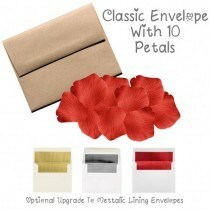 We use red silk rose petals in our envelopes, not real ones. This is simply because real rose petals would not be able to handle the journey through the US Mail system, and would arrive all smashed. Not only do our red silk rose petals arrive completely in-tact, they will never die, allowing your recipient the chance to cherish their gift forever. Not only will your recipient smile when they receive your rose petals gift, but they can re-experience this moments over and over every time they open their rose petal filled envelope year after year. Rose petals can be a symbol of love and expression of one’s admiration to someone therefore; sending rose petals on Valentine’s Day is a brilliant idea that will surely make any recipient happy and delighted. DeliverRosePetals.com is the most trusted site that makes it easy for individuals to express their love by delivering unique gifts to their special someone anywhere in the world. Aside from the typical bouquet of flowers, chocolates and bottles of champagnes, individuals can now show their loved ones how much they care by sending or delivering rose petals.